In this blog, I will be reviewing museum exhibitions around Washington, D.C. and other cities. I interned at a museum in New York this past summer and have become very interested in the communications behind museums and the exhibitions themselves. I find myself seeking out museum exhibitions to visit in my free time and am always looking for what is new and trending in the museum world. The Renwick Gallery, part of the Smithsonian American Art Museum, is an appropriate museum to begin with as it has garnered a lot of attention from the media for its interactive installations and encouragement of photos and social media engagement, especially this year. The museum’s most recent exhibition, “Connections: Contemporary Craft at the Renwick Gallery”, ties into the idea of social networks and had many pieces on display that stood out to me in the variety of materials. The curators were able to make a connection with the internet when explaining the exhibition: “Objects are loosely thematically organized to mimic an analog version of the Web, using an associative approach derived from the way we navigate today’s ‘hyperlinked’ world” (from “Connections: Contemporary Craft at the Renwick Gallery”). The way in which the exhibition looked for networks and links in a totally different realm (art and design) stood out to me. It seemed to be a bigger representation of a trend in the world, and the materials ranged from everything from very modern (fitting with the subject) to very traditional (possibly acting as a juxtaposition to the subject). 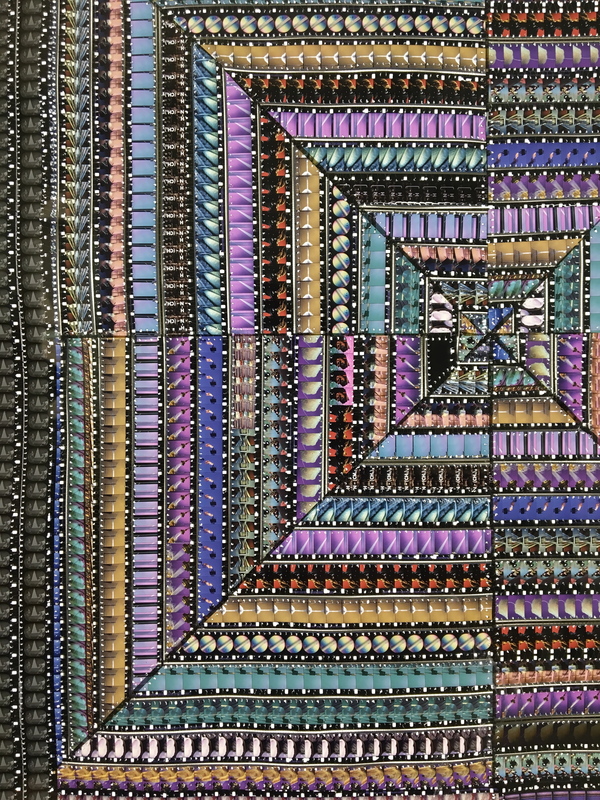 One piece that stood out in particular to me was Sabrina Gshwandtner’s piece, “Fibers and Civilizations,” that was made with 16mm film and polyamide thread. The piece was striking both due to its vibrant and eye-catching colors, but also for the way the viewer was able to see all the tiny photos when looking at the piece up-close (see a zoomed in photo of this piece at the top of this post). I particularly love how you can see the tiny little shower heads in the film. I simply love the pattern and color in this piece and how the piece appears different from up close than it does from a distance. The photos shown at the end of this post show the variety of materials on display in the exhibition. There was clearly a lot of consideration put into showing a range of materials as you walked through the exhibition, yet you could also find similarities between the pieces in each room. One detail that stood out to me was that there were colored dots that led from one room to the next in the exhibition, seeming to once again point out the “connections” between rooms and pieces on display (see photo below). “Photography encouraged” sign- pretty cool. The Renwick Gallery has been able to capitalize on the benefits of social media- particularly Instagram- and it has not gone unnoticed by the media. Washington City Paper recently published a piece, “Art Blanche,” by Kriston Capps about interactivity in museums in D.C., citing the Renwick as one of their main examples. Earlier in the year, The Atlantic published a piece “Art for Instagram’s Sake,” by Katharine Schwab that discussed how one of the Renwick’s past exhibitons “Wonder” had been very popular with Instagram users. Throughout the Renwick, you will see text on the wall that says, “Photography encouraged.” Many museums have moved towards having more photography-friendly environments, yet it is still very notable at The Renwick. More and more, it seems that visitors are upset when they can’t take photos….maybe a millennial thing, but it definitely seems that social media has helped to catch the attention of many potential visitors. Overall, I was very impressed with the exhibition and how its main theme connected with a bigger world idea- that of networks and links. I was very drawn to the fact that I could see many different materials and art techniques on display, yet I could also find similarities between pieces. Detail of Sabrina Gshwandtner’s “Fibers and Civilizations”. Made with 16mm film and polyamide thread. Matrix Series “Amphora…Save” by Brent Kee Young. Made with borosilicate glass. This is so cool! I work at the Air and Space Museum, my roommate just graduated with a Museum Education degree – basically you could say that my life is 99% museum-related. I’m so interested by the idea of art museums that encourage photography; I can see both sides of the argument. On the one hand, I think that people like interacting with art, and I think that photography makes people feel like they’re more connected to the art if they can photograph it. I also remember a really great experience I had at the Renwick last February when a security guard helped a group of people find the right angle to take a picture so that the shadows lined up just so. It wasn’t his job, it was just something that he noticed from standing there for hours day after day; but it helped bring a group of people together to discuss the art more thoroughly. On the other hand, I know that people in art museums often stand in front of art less than 8 seconds, take a picture of it, then head away to the next one. It’s an interesting debate I know lots of people in the museum field will be talking about the next few years! I wish I had thought of this, I always aspire to go out and see more museums, living in D.C. for more than two years now, but I rarely do. So I am glad that your blog will allow me to experience museums as you describe them and will likely inspire me to go out and see them for myself! I look forward to reading more! Your blog included so many details and incite about this exhibit that I was able to get a real feel for what it was like to walk through. Your photos accompanying your text really enhanced the blog overall. One of the articles I read for our tweeting assignments was about selfie installations in museums and it definitely made me think about how selfies and social media are changing the way we view art. Your experience and knowledge of museums definitely shows through your writing and I am definitely interested in hearing more about your thoughts on museums and how they have changed in the social media age.